Stores that train more, sell more — we can prove it! Ace Pre-Show Training is a great opportunity for you to learn valuable tools that will help you elevate your store’s performance and have continued success. Kane Calamari, Ace vice president of human resources and communications, will deliver the keynote address on Wednesday, March 15. This presentation will focus on how you can build a great culture with three key ingredients: leadership, engagement and culture. Building on this presentation, participants will attend a session on “Defending Our Weapon in the World”. Is Ace positioned to win its 11th consecutive JD Power award? What if your store was the only one to be evaluated — would we win? Gain actionable practices to take home and implement, whether you’re new to the journey or a seasoned veteran. In addition, there will be two afternoon time slots where retailers can select from different training sessions to attend. 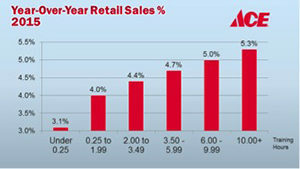 “Merchandising for Profits”: Are you managing your most expensive real estate in the store as profitably as you can? “Retail Simplification”: Join this interactive session to learn about these improvements, including what we’re working on and how to keep your team informed. “5 Ways to Motivate People Around Inventory Management”: Ensure your staff is going the distance when it comes to inventory management. “The Best Brands Programs and How to Bring Them Into Store”: Do you carry the brands that customers really want and are looking for? Register today for the 2017 Spring show and Pre-Show Training before spaces are filled! The pre-registration deadline to get badges and event tickets in the mail is February 10. The cost for Pre-Show Training is $150 per person and includes a continental breakfast and lunch.